When looking for a new office, consider the capital cost saving of a serviced office Toronto. A lot of businesses who are not familiar with the concept of Toronto serviced offices do not realize the saving on capital costs they could make if they rent serviced office Toronto, as opposed to renting conventional office space. • There is no need to purchase office furniture. All the offices are fully furnished and there are several office furniture options to choose from. • You do not need to invest in a telephone system. Each serviced office suite Toronto comes complete with at least one telephone. You can request more phones depending on the office space you choose. • Why pay rent on a boardroom space that you will not always use. 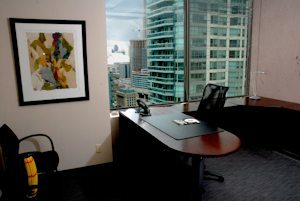 When you rent a Toronto serviced office, you have access to several small boardrooms and larger meeting rooms. • No need to purchase or lease office equipment like photocopiers, printers or fax machine. Your serviced office for rent Toronto gives you access to network printers, several fast black & white copiers and full-colour photocopiers that are also network colour printers. • You do not have to hire someone to answer your calls. Your serviced office space Toronto has a professional receptionist answer your calls the exact way you want according to your specific instructions. • You avoid the cost of wiring your office for high-speed internet. All of the serviced office Toronto suites are pre-wired for reliable, ultra-fast network connection.